The Book Group meets twice a month for 10 months of the year. Our ‘Quiet Months’ are July and August. Meetings are held in the Reading Room (also called the Library). We have two groups meeting: Group A meets the 1st and 3rd Mondays each month and Group B meets the 2nd and 4th Mondays each month. If Monday is a holiday we meet on the following Friday. The Book Group studies books. Each year, members submit titles of books they would like to study that year. From these titles the club selects the book for study. 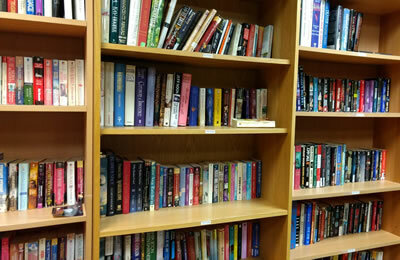 These may be current novels, classics, biographies or poetry. The range of titles is extensive. Each year the Book Group has received a grant from the Aurora Arts and Culture Fund. These funds are used to defray some of the costs of book purchases. Members pay the balance individually. There are presently some 20 members in the Book Group. If you are interested in joining, please enquire at the Reception Desk.